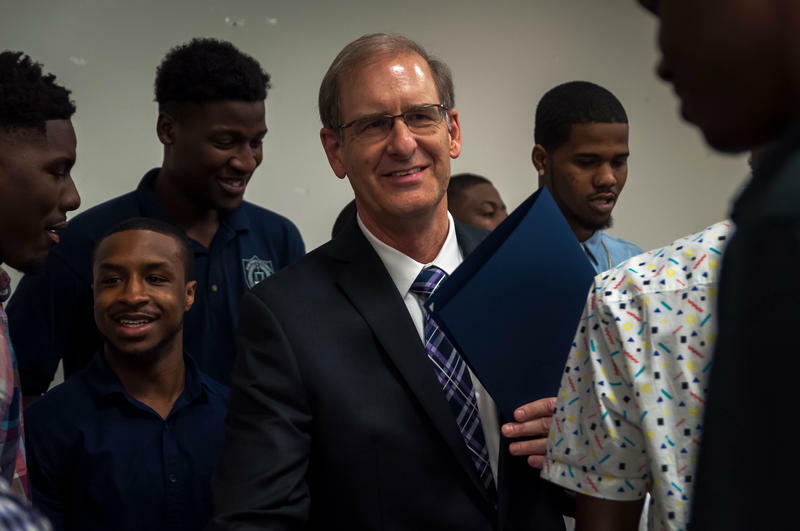 St. Louis Community College Chancellor Jeff Pittman greets members of the men's basketball team at a Board of Curators meeting Thursday evening. That last time buyouts were offered — a decade ago — about 19 percent of eligible workers took the package, according to Pittman. The school lost $3.8 million in state funding this spring and the coming fiscal year’s proposed budget includes an even deeper cut. The college is also looking to sell a downtown building and consolidate administrative offices at its Forest Park location. School leaders say freeing up personnel costs will allow the school to overhaul program offerings, which they hope will attract more students. That could include more continuing education and workforce-training partnerships with companies, Pittman said. “We need to get ourselves focused on the types of programs that will draw more enrollments in and increase our revenues that way,” he said. Campus leaders said they’re focused on student experience. “We’re not in jeopardy, if you will, of any kind of major impact to students, to resources students need to be successful,” Forest Park campus provost Larry Johnson said. The system serves about 19,000 students in all, a number that’s been trending down since a high of nearly 30,000 during last decade’s recession. That slide is starting to show signs of reversing, according to Pittman. 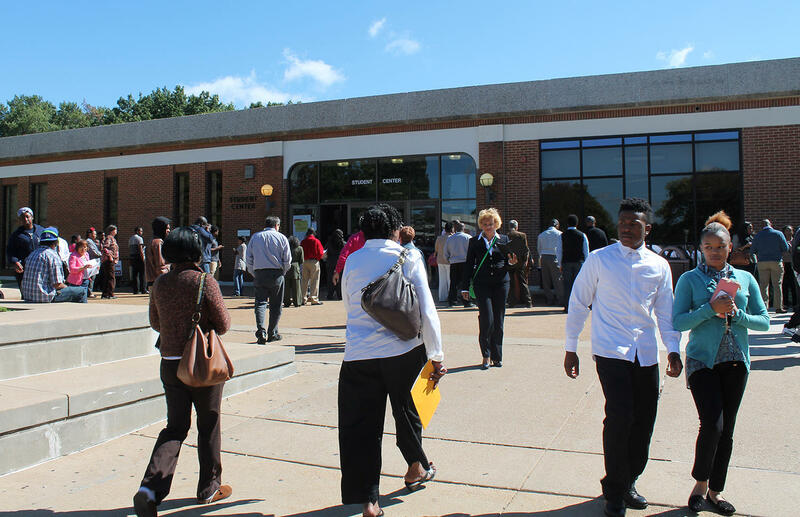 People walk into a job fair at the St. Louis Community College Florissant Valley campus on Sept. 14, 2014. The early retirement will be available to workers over the age of 55 who have worked for the school for at least five years, or anyone who has worked for 20 years at the college. Munden said he’s talked to coworkers who are eligible for the buyouts, but they haven’t made decisions yet. “They’re approaching it cautiously,” he said. Over the next two years St. Louis Community College will be undertaking a number of steps to better support students from diverse backgrounds, from a review of faculty representation to accommodations for parents. Among the new initiatives included in this iteration of the college’s diversity plan are efforts to bring students from different campuses together, and a push for faculty to address race, class, gender and other issues in its curriculum.